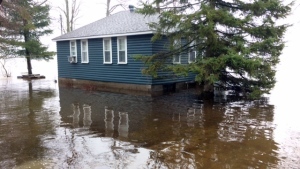 Residents in communities across the national capital region are dealing with flooding as the Ottawa River surges to a level not seen in at least two decade. In Gatineau, many residents are sandbagging their homes, with city officials distributing In Pontiac, some waterfront areas were under an evacuation order on Thursday. And in the town of Rigaud, the rising river prompted a state of emergency to be declared. About one hundred people were ordered out of their homes; many of whom were forced to stay in hotels and emergency shelters. Experts say the flooding across the region is being caused by extensive rain and melting snow. And while it should dry up the next few days, it could take weeks for the high water levels to recede.